In stock -This product will ship today if ordered within the next 4 hours and 35 minutes. Replace your kitchen towels and cleaning cloths with these eco-friendly, money saving, reusable bamboo sheets. 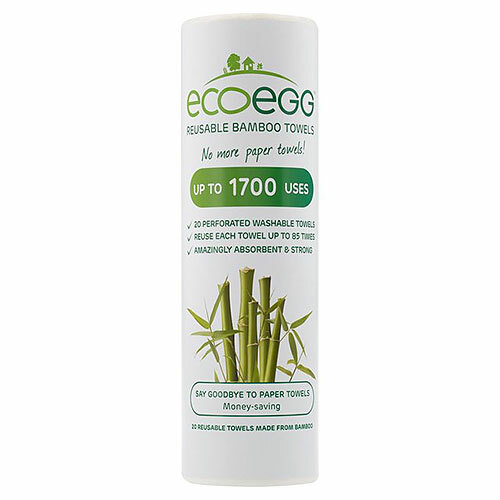 Made from a certified organic bamboo source, Ecoegg`s Bamboo Towels are strong and absorbent. Use them wet or dry for spills, messes, cleaning, wiping, dusting, drying and more! They never scratch and never leave any lint or residue. Unlike normal kitchen paper which you use once and then throw away, these are reusable! Just pop them in your washing machine – they get softer and more absorbent every time you wash them. Each sheet can be washed and reused 85 times, and with 20 sheets per roll you’ll get 1700 uses from each roll! Each sheet can be washed and reused 85 times, and with 20 sheets per roll you’ll get 1700 uses from each roll! Use as needed to clean up spills and messes. Alternatively use to clean dust from around the house. Please note, after use these will not be able to be put into a roll again, it is recommended that you store it in a Tupperware box, old tissue box or zip lock bag somewhere handy and easy to reach to wipe up those spills. Below are reviews of Ecoegg Bamboo Towels - Single Roll by bodykind customers. If you have tried this product we'd love to hear what you think so please leave a review. For me this does not replace disposable kitchen towel. They do wash well and make great cloths but I usually use kitchen towel to drain greasy food, wipe greasy pans and wipe spills of food that stains. I’ll try the disposable bamboo kitchen towel instead. I go through a lot of kitchen roll at home as I like to use it when cleaning. I discovered this product in an email from bodykind and was intrigued - in my effort to use more eco-friendly products in the kitchen I decided to give it a go. I love that once the roll is dirty you simply throw it in the washing machine and can re-use it. It is true that the more you wash them the softer they get! Highly recommend. Replace your kitchen towels and cleaning cloths with these eco-friendly, money saving, reusable bamboo sheets. 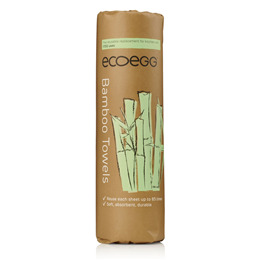 Made from a certified organic bamboo source, Ecoegg`s Bamboo Towels are strong and absorbent.